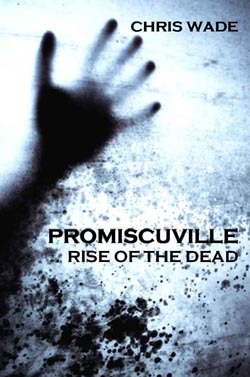 Promiscuville: Rise of the Dead, by Chris Wade – Book Review | We Zombie! I received a review copy of Chris Wade’s new book, Promiscuville: Rise of the Dead, and I was quite pleasantly surprised. Wade manages to captivate the reader with intense zombie action expertly described in scene after scene. Many times during my reading, I had to put the book down and check to see if any gore splattered on me; I felt as if I was there along with the characters. Promiscuville is a very bad town – lots of prostitution, crime, adultery – a perfect setting for all hell to break loose. Wade seems to be making a statement on our current society with this book, and perhaps we should all take heed. The story starts off with Beth, a crazy woman being treated by psychiatrists for killing her wife-beating husband in a very disgusting and grotesque way. She claims innocence, but of course no one believes her. As I read about Beth, I felt that I was reading a cross between a Stephen King novel and a George Romero movie script. There was something creepy about this lady, so I wasn’t sure whether to like her or not. I was able to decide by the end of the book, though! Beth and a group of survivors have to make decisions if they want to stay alive, and not everyone makes good decisions. I think Wade could have given us more background around the criminals – there is a lot of potential for weirdness there, but my imagination filled in the background for me, and I’m sure yours will, too. This is a great read, and I think Wade is on to something with the setting of Promiscuville. I can see a franchise of sorts similar to the famed town of Necropolis, with lots of ongoing stories as the town evolves through the apocalypse. Definitely worth your time to read this one. This entry was posted in Books, Fresh. Bookmark the permalink.